Do not underestimate the back roads of South Africa. On our last trip through our beautiful country we took secondary roads to reach our interesting destinations. It is not the shortest route, but is definitely the most rewarding. Please click here (http://wp.me/P3cDRy-aV) to see the itinerary and here (http://wp.me/P3cDRy-aY) to see a photo gallery of the sights and surprises on this route. Golden Gate National Park: The eastern Free State is one of the most beautiful areas in our country. Harrismith: The town is situated at the foot of the Platberg (flat mountain). The mountain is 9 km long and 2,394 m high. Verkykerskop: (farlooker’s hill) Named after a hill from which you can see far around you, this little town offers a trip back in time. A quaint little general dealer and Smiley’s Slow Foods Restaurant as well as a small hotel. Definitely off the beaten track but the scenery around is beautiful. Bloemhof Dam: Little know fact – but Bloemhof Dam is the largest dam on the Vaal River. Yes, even bigger that the Vaal Dam. Lovely accommodation on the river and a popular spot for fishing. Witsand Nature Reserve: White sand dunes are surrounded by the well known red Kalahari sand. These white dunes are known for their ability to “roar”. 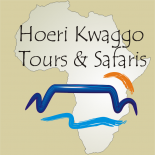 Beautiful Kalahari experience with birds and wildlife. Putsonderwater: Although we did not turn off to this little town, we did stop at the N10 turn-off and take a few pics as the clouds were perfect for beautiful photos. Prieska: On a hill overlooking the town the British build a fort with tigers eye during the Ango-Boer War. Loxton: Most probably one of the most beautiful towns in the Karoo. The community is very proud of their town with rows of trees lining the streets and telephone poles running in the middle of the streets. We could not find one piece of paper lying around. Pavements are swept every morning! Lovely accommodation and places to eat. Beaufort West: Next time you drive through Beaufort West do yourself a favour – turn off the main road in town and discover beautiful old houses and buildings. Karoo National Park: You say Karoo and you think – flat and dry. You will be mesmerised by the beautiful mountains and passes as you travel through this park. As a bonus you will also see, among other, gemsbok and lion. Accommodation is beautiful with stunning views. Dakota in the bush: On the R46 road between Touwsrivier and Ceres. This entry was posted on July 25, 2017 by liana in Karoo, Kwazulu-Natal, Misc., Mpumalanga, Wildlife.